After the successful arrival of the MOM in Mars Orbit, ISRO has taken the more mundane step of putting the 3rd of 7 satellites for India’s satellite navigation system into place. ISRO’s Polar Satellite Launch Vehicle, PSLV-C26, successfully launched IRNSS-1C, the third satellite in the Indian Regional Navigation Satellite System (IRNSS), in the early morning hours of today (October 16, 2014) at 0132 hours IST from Satish Dhawan Space Centre, Sriharikota. This is the twenty seventh consecutively successful mission of PSLV. The ‘XL’ configuration of PSLV was used for this mission. Previously, the same configuration of the vehicle was successfully used six times. 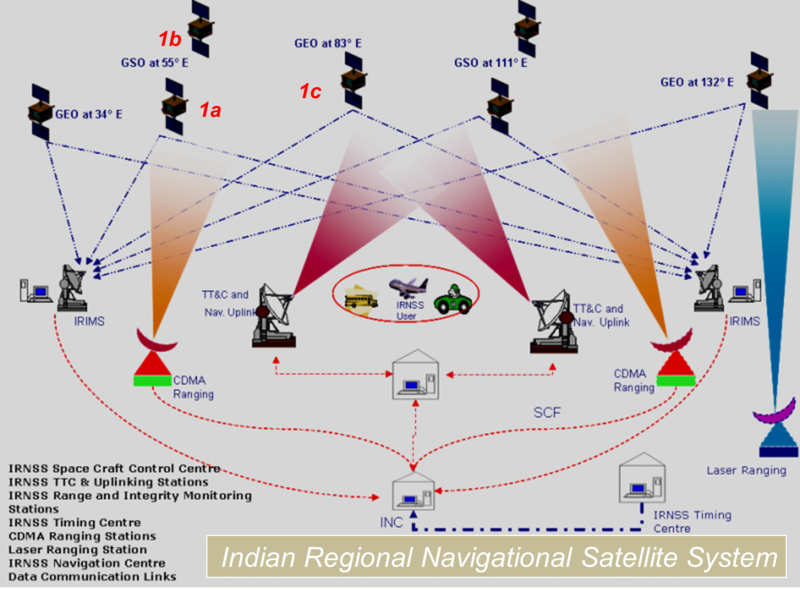 The Indian Regional Navigation Satellite System (IRNSS) is India’s 7-satellite global positioning system. It is similar to the GPS of the US, Russia’s Glonass , Europe’s Galileo China’s Beidou and the Japanese Quasi Zenith Satellite System. The IRNSS is autonomous and under the control of the Indian Government. 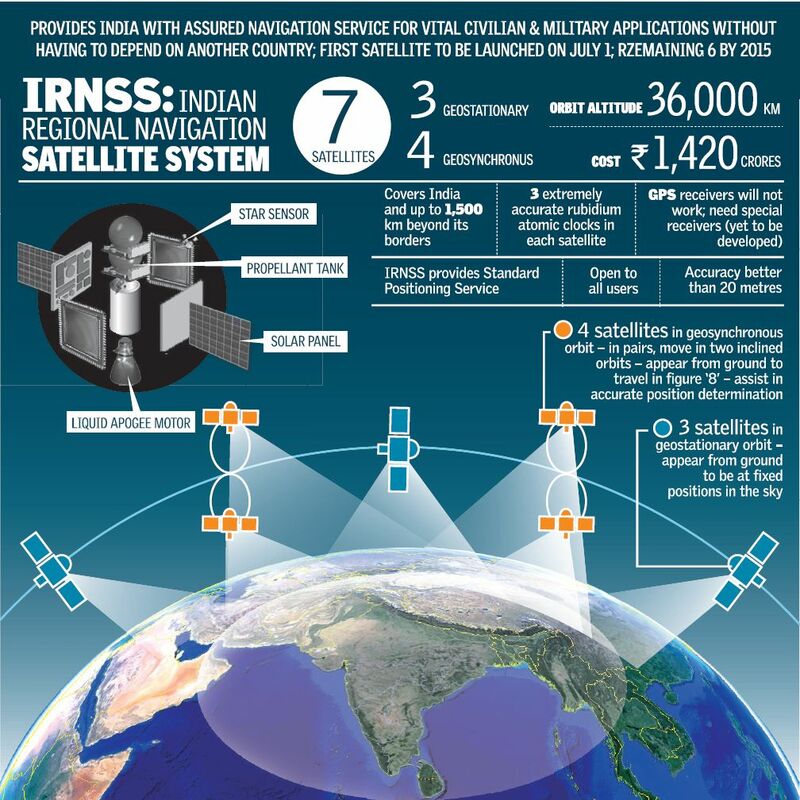 In addition to providing civilian navigation services (Standard Positioning Service – SPS) in a region extending 1500 km beyond the country’s borders, the IRNSS will also provide encrypted military and strategic services (Restricted Services – RS) independent of foreign governments. The positioning accuracy is designed to be 20 m in the primary service area. Each satellite is designed for a life of 10 years. The IRNSS program received government approval in 2006 and is planned to be fully deployed by the end of 2015. The budgeted cost is 14.2 billion INR (about $240 million) and must count as another example of ISRO’s “frugal engineering”. The cost includes for two stand-by satellites on the ground making nine included in the budget. As a comparison Europe’s Galileo navigational system comprises 27 satellites and is expected to cost about 50 times more at about €10 billion ($13 billion). The 7 satellite system consists of 4 satellites as two pairs of geosynchronous satellites and 3 in geostationary orbit. The first two satellites in the series, IRNSS 1a and IRNSS 1b formed the first geosynchronous pair and were launched from Sriharikota on July 1st, 2013 and April 4th this year. respectively. The IRNSS-1c launched this morning is the first geostationary satellite and carries two payloads, one for transmitting navigation service signals to users and another consisting of a C-band transponder to facilitate Cube Retro Reflectors for laser ranging. It is the central satellite of the seven satellite configuration. The satellites launched so far are individually operational but the system will become operational only with the next launch of a geostationary satellite. (The system needs one geosynchronous pair, the central satellite and one more geostationary satellite to reach the threshold conditions to become operational). All seven satellites are planned to be in place and operational by the end of 2015. Based on ISRO’s I-1K satellite bus, each IRNSS satellite has a mass at launch of 1,425 kilograms (3,142 lb). Unfuelled, the spacecraft has a mass of only 600 kilograms (1,323 lb), with the remaining 825 kilograms (1,819 lb) being taken up by propellant for their apogee motors and manoeuvring engines. The spacecraft are designed for ten years’ operational service. Generating 1.6 kilowatts of power through twin solar arrays, the satellites broadcast L5 and S band navigation signals. C-band transponders and retroreflectors are used for range calibration. Each satellite is fitted with a single liquid apogee motor producing 440 newtons (99 pounds-force) of thrust. Three-axis control is provided by reaction wheels, magnetorquers and twelve reaction control thrusters. The apogee motor is tasked with propelling the satellite from its initial deployment orbit into the final geostationary orbit, while the remaining thrusters will be used to manoeuvre and orient the spacecraft once it is in orbit. IRNSS-1C is the first geostationary satellite in the IRNSS system. Planned for operation at a longitude of 83 degrees East, it will operate at the middle station of the constellation. Two more geostationary satellites will be added; at longitudes of 34 and 132 degrees, while the remaining four spacecraft will operate in inclined geosynchronous orbits to increase the angle of separation between signals. Two of the inclined satellites are already in orbit; IRNSS-1A and 1B operate at a longitude of 55 degrees East. A second pair will be located at 111 degrees East next year. The PSLV launch vehicle was introduced in 1993 and this is its 28th successful use (27th consecutive successful use). Today’s launch used the PSLV-XL configuration – the most powerful version of the PSLV currently flying – which makes use of six PS0M-XL boosters containing S-12 solid rocket motors. Four of these motors are lit when the rocket leaves its launch pad, with the remaining two lit during the early stages of its ascent.